What is the HandyReader HD? 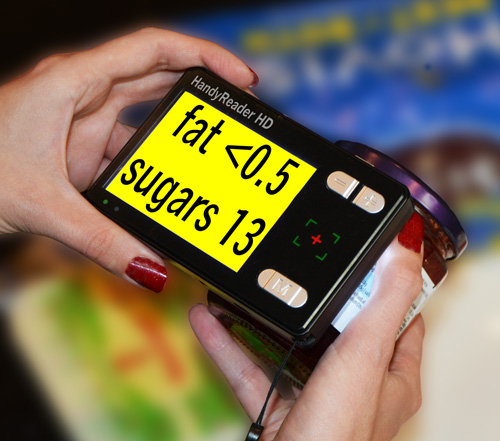 HandyReader HD is an electronic handheld video magnifier with easy to use controls. It can magnify any text or images from 2x up to 24x times. It is one of the most cost effective solutions available, often costing less than the magnifying glasses it is used to replace. Who is the HandyReader HD for? The HandyReader HD could be an ideal solution for someone who is struggling to read or is using an optical magnifying glass but finding the text is distorted or is not large enough. It has clear, simple, tactile controls which makes it easy to operate users of all ages. The high contrast 3.5" screen with variable magnification up to 24x makes reading far easier than traditional magnifying glasses. Would like a portable solution that you can use around the house, when shopping, at restaurants etc. What are the HandyReader HD's benefits? Ease of use: Simple, clear, tactile controls make the HandyReader HD extremely simple to operate. Magnification range: Continuous, smooth magnification adjustment from x2 to x24 means you can find the perfect magnification level for your eye condition and the document you're reading. Integrated LED lighting: With integrated LED lighting the HandyReader HD's display is always clear and easy to read, even in low light conditions. Size: At just 115 x 75 mm, (4.5 x 3 inches), The HandyReader HD is one of the smallest handheld magnifiers on the market. Weight: HandyReader HD is one of the lightest handheld video magnifier weighing in at just 150g, (5.3 oz), making it easy to carry around with you. User replaceable battery: Unlike other system, the built in rechargeable li-ion battery of the HandyReader HD can be changed by you, so it does not need to be returned when it wears out. TV connectivity: You can also plug the HandyReader HD into your television with the included cable which provides a far greater maximum magnification.